These brackets reinforce connections between table rails quickly and easily. No gluing and no clamping required. I'm saving these for a future project. I bought them for a dining room table project, but my legs were designed to fit inside the aprons instead of as shown in Rockler photo. Also my legs were rectangular. I was till waiting for these brackets to arrive, so I designed another way of fastening legs to table aprons. I built a box that fit around the pair of legs on each end and used my threaded inserts to fasten legs on 2 sides. 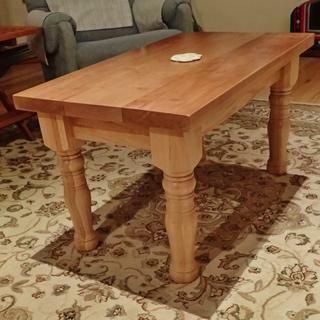 I have been looking for a sturdy corner bracket to use with the 3.50 inch square table leg and with information I received from Rockler I was able to secure the leg with no problem at all. Having the two bolt setup made attaching the legs to the apron with no wobble at all. 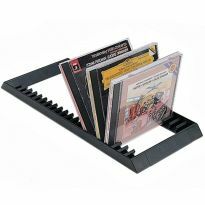 Sturdy, easy to use brackets. After going to 3 box stores and 3 specialty hardware stores and no one having anything close. These were exactly what I was needing. The bracket worked perfectly for the table. Excellent. Wish they come in a smaller size. 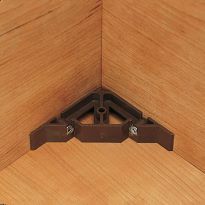 They work very well to make a secure and rigid connection of legs to a table top. If you’re trying to build a table frame or other structure in a quick and simple way, these brackets will do it. Little to no woodworking experience is necessary to line up these brackets flush with the frame and then the table legs. And then you’re done. It takes way longer to stain and finish the piece. I really like the corner brackets. They are well made and make the table very strong. Really a great buy. Well built steel support. Does not match my chair perfectly but I doubt I would find the exact one. However it did the job for the repair. NOTE description carefully. The hanger bolts and nuts are NOT included. It was as I expected, I really don't like the kerf mounting brackets as I repair a lot of furniture and most of the breaks occur at the kerf, but honestly I was looking for the one with one screw hole instead of two that I have used in the past but was unable to find them, I sure they are the same manufacturer but not available online or in catalogs so I went with these which fine as I will just use one hole. Used this for a card table. I was looking for a bracket that allowed me to remove the table legs when I had no need for the table and this fit the bill perfectly. I'm a novice at this, but this was easy to install. I especially like the design of this bracket because it has screwing surfaces on both skirt-boards as well as the top, so it ties the three together, and holds the leg in place. Used these on a new farmhouse table I was building and it was amazing how much stronger and sturdier they made my table. Will use again! Loved these corner brackets. I made a couple Leggo tables for a friend's grandchildren. The use of these brackets for the aprons and legs and fasteners for the top made these tables so sturdy I have no worries about the kids even climbing onto them and dancing on top. I'll continue to use these items as I build various projects for friends and family. great brcket for it's size. 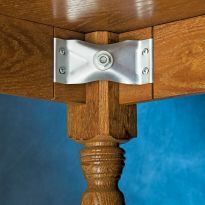 These brackets are well designed and, properly mounted, provide a durable, stiff interface for table leg installation and removal. I would have liked to have been able to buy a wider bracket to bridge the apron gap created by my use of a large leg dimension plus almost zero reveal outboard of the apron. By adding blocks as shown, I added stiffness to the leg attachment and reduced the opening in the apron. Very serviceable solution for stabilizing leg joint with apron. Good product. worked just as supposed to. there easy to install. Works exactly as illustrated in the catalog photo. Provides a strong support for legs and table apron. Simple to install. 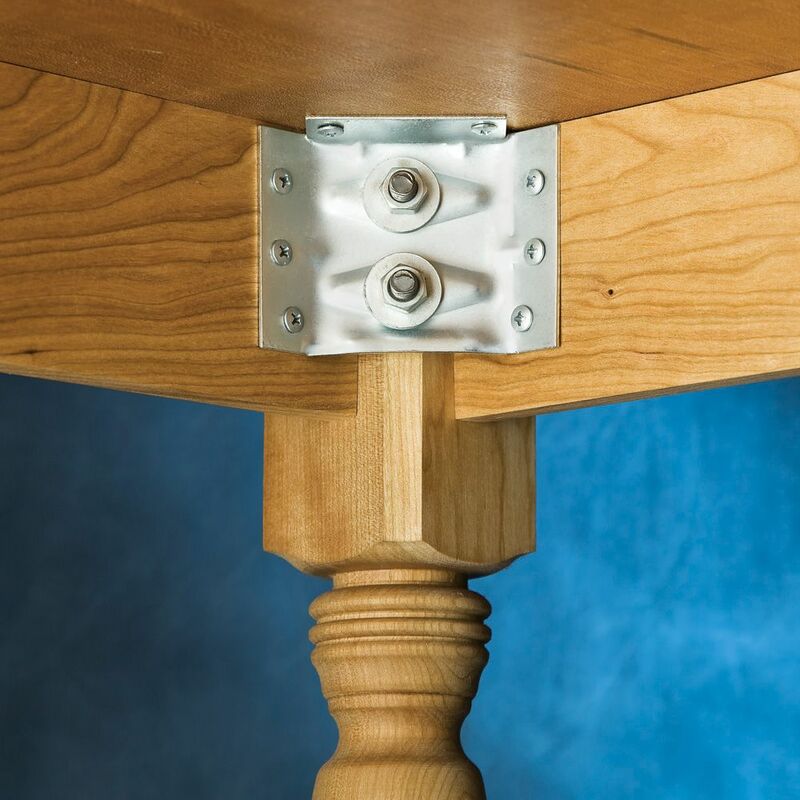 EASY INSTALLATION, SUPERIOR HOLDING POWER FOR TABLE LEGS. USING 3/8 BOLTS TO SECURE 3X4" LEGS. you need these to insure a strong table leg installation! These were perfect for my project. I made a crafting table for my wife. They worked great and were very easy to install. Well made, holds the table top, aprons and legs together very nicely. They are working like I expected. Dressing table was damaged during a move, these did the tick to save the dressing table seat legs. Wife is happy! the brackets are very sturdy and easy to install. I eill use them again. Sure made it easy using the corner clamps for legs. Great product. I would recommend this product to a friend. First table build .The corner clams were a great help. Exactly what my project was missing. They are exactly what I need to support the legs of a handcrafted workstation desk. Very good brace easy to install and very strong. I need a way to break down dining table in case I ever have to move it. I'll need to make connection adapters since legs are not square and table apron goes around leg instead of as shown in photo. Seems to be simplest way to connect corners securely. Looked like it would do the job for the farmhouse table I'm building. This is a quick and easy way to attach a leg to a table. Good reviews and I like the fact they screw into the table top as well. 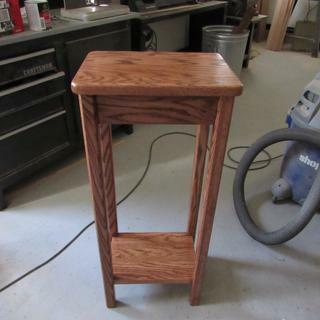 Need to repair an older vanity bench that used mortise and tenon joints. WWGOA recommendation on a wood plan. Look like a well made bracket. Making farm tables with removable legs. this will make that easier. I'm building a 8ft oak farm table and needed something with lots of reinforcements. I believe they will work well to reinforce the leg-to-apron mortise and tenon joints on four tables in which the wood is splitting around the retaining dowel holes in the legs. Having a 3.50 inch table leg, I asked for assistance as to which corner bracket would be best to use and I received information from Rockler that this bracket would be best for me to use for my project. Had a outdoor bench with wood version. It rotted and broke. So Iooked for a replacement and decided to replace all four corners. Looks like this product will solve a problem with mounting legs to a kitchen island. We'll see. building a drop leaf table, would more stabilize the legs. Hoping for a lower profile in corners. Converting an existing table into a (board) gaming table. Building a lower box under the current table top. Converting tabletop into a series of removable sections. Need to fix legs that are loose on my dining room chairs. I want to see if these will work. 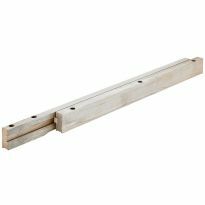 I am making a farmhouse table and need mounting brackets. To have a strong leg support. Best way to firmly secure table legs. I enjoy building tables and these are easy to install and they hold well. What is the spread between aprons? (Actual dimension between the 45 degree bends) didn't see a tech drawing. what size hanger bolt go with these mounts? BEST ANSWER: It looks like the hole on the bracket would accommodate up to about a 3/8 inch bolt. I don't have the table handy now, so I can't tell you what size I actually had. It was an existing table. In my experience a 5/16-18 x 2 1/2 hanger bolt works well for a 1 3/4 square leg with this bracket. I need complete dimensions for this. I am going to try to use this to reattach a leg that has broke the wooden apron brackets? BEST ANSWER: From edge to edge [Keep in mind, the ends are angled at 45 degrees) 3 1/4" wide, 2 5/8" tall. the two angled edges that bolt to the table apron are 3/4" wide X 2 1/2" long and the top edge that bolts to the table top is 3/4" wide X 2 1/4" long. How far apart are the holes on these brackets? BEST ANSWER: 2 holes one above the other are 1-1/8" center to center. Thanks Steve! Info should be in specs. Do these brackets come in smaller sizes, for smaller tables? BEST ANSWER: I used them on child's table! Worked fine. They should be fine for 3" square legs. Two screws tie the bracket to the table top. Four screws tie the apron to the bracket. Two wood screws to machine bolts are used to tie the legs to the bracket. The length of the apron determines if the legs wobble or not. The wood screws to machine bolts squeeze the legs against the apron. If the apron is to loose the legs will not tighten up. No pocket screws. I just attached the brackets to the aprons with regular wood screws, then marked and match drilled the legs from the brackets for the hanger bolts. Just make sure to drill the hanger bolt holes straight. No. The bracket screws to the apron, then the legs attach to the bracket by the two studs and nuts. The legs stay independent from the apron but are drawn up tight against them making for a solid support leg. Thanks how far do you know to connect the bracket from the ends of the aprons. Does this leg have mount for hanger bolt or dado? Can it be used with these corner braces? BEST ANSWER: It uses pre-drilled pocket holes to mount the brace to the apron. It uses bolts to mount the leg to the brace. You could use hanger bolts to mount the leg to the brace. Thanks. 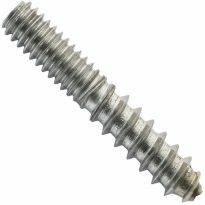 What size of hanger bolt has to be used? Does it have one pre-drilled pocket hole or two? If two, what is the distance between two holes? If I remember right the bolts and screws come with it. I believe it is a 3/8" bolt 3" long and its 6 total predrilled holes on each brace, 3 on each side. The pic of it at Rockler is the brace you get. The legs I used had to be pre-drilled for the bolts. They did not come pre-drilled. I hope that is the what you are asking. The leg is square at the top so it would probably work with either the corner brackets or the brace kit. 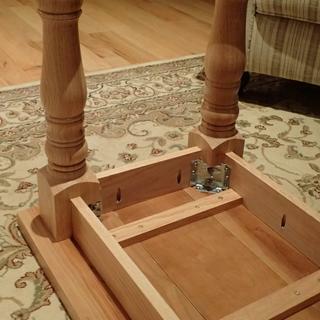 How do you install the table leg brackets so that they hold the pieces together firmly? 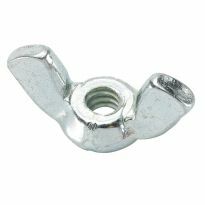 Do you put the screws along the edge of the bracket in first and then tighten the nuts of the two bolts in the center? Should there be some space between the bracket and the leg so it bends slightly and pulls the aprons into the leg tightly? BEST ANSWER: I installed the bracket to the table aprons first, then attached the leg. 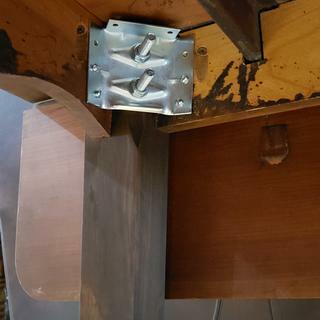 Yes, I think there is some clearance between the bracket and the leg--the leg is positioned primarily by the aprons, and is just held tightly against them by the lag screws and nuts. Install screw into the aprons first then use hanger bolts with nuts. Leave about 1/8" gap. Could you just use some lag bolts to tighten up the legs? BEST ANSWER: Yes. Provided their not to long. the ease of removing and installing the table legs. Wing nuts can then be used. 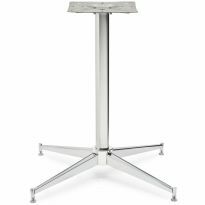 Table legs loosen from the humidity changes and table movement. 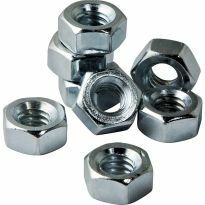 Wing nuts can be tightened easily, where lag bolts will require a wrench each time. Yes, you could use lag bolts. BEST ANSWER: 4 in a pack. They look good, plenty heavy. and we plan on using them on our custom tables. Hey I bought these and you get a set of 4. Pretty easy to use. There are four in a package. Distance between centers of hanger bolt holes? BEST ANSWER: Center to center dimension is 1 3/16 inches. kerf mount corner bracket------what size mount will i need for a 3 1/2 inch post ? BEST ANSWER: You should be able to use bracket shown. To properly center the post in the corner some adjustment will be required. Either adding a spacer to the apron or shaving the corner of the leg. The 2 5/8 x 3 3/8 bracket will do fine with a post that size. Would this be suitable for attaching 4x4 legs? Or should I try and find something bigger (suggestions welcome)? BEST ANSWER: These will work, but the skirt will not line up with the center of the 4"X4" leg. You may wish to had a shim to the back of the skirt on each side. I had thought about that -- I figured the skirt might need to be moved inward closer to the table center in order to compensate, but measuring out a good thickness for shims sounds like an even better idea. You rock. That's an awesome suggestion. I would feel comfortable using these mounts on a 4X4 leg. These brackets mount firm and are quite sturdy. How many are in a pack or just one per pack? 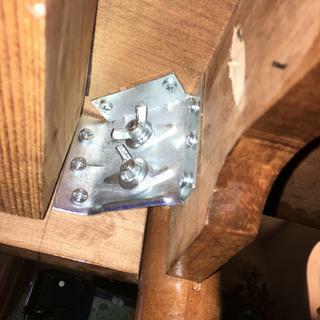 What size wood screws are needed for the table corner brackets? Jay, I used #10 pan head wood screws. I am building a bar height oak dining table. Am wondering if I should use a mortise and tenon joint and use these to reinforce? Any thoughts? BEST ANSWER: It sounds like it would be a good reinforcement. A bar height table would put a lot of stress on the joints so any reinforcement would be beneficial. How many brackets per pack? Are these stainless steel wanted to use for an outdoor farmhouse table? BEST ANSWER: I have used these corner brackets on two different tables. Easy to install and they provide strong leg-to-table support. Best, for me, is that legs can easily be removed if table needs to be taken apart for storage or transport. Are they stainless steel for outdoor use? Rockler could confirm if stainless or not. As they are under table, would likely last many years even if not stainless. Could spray a clear lacquer or similar after installation for added protection. 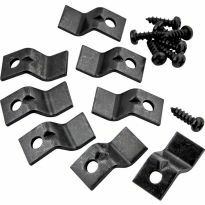 If I want to use the "Surface Mount Corner Brackets for Table Aprons" (Item #: 24279) to attach these to the apron, what size hanger bolt is recommended? What is a complete list of screws bolts nuts etc. To install these? can i use these brackets to attach 6x6 farm table legs ? what size do the leg need to be? Do these brackets come in smaller sizes for shorter aprons? BEST ANSWER: Janet, I always like to use the largest bolts that I can for holding the legs in place. I used 3/8" X 3 " bolts to secure the legs to these corner brackets. Need to attach vanity seat to bench frame what kind of hardware do I need? I need the bracket the table leg screws into? How much gap should be left between the bracket and the leg? my table legs are 1x1 what size bracket should I use?